If you have only gone to yoga classes, and never practice without the lead of a teacher, try a simple practice at home. Since yoga is a mental and spirital discipline, beyond just a workout or physical practice, the benefits of being your own true "Guru" or teacher are numerous. The simple act of turning off the phone, not listening to the mental distractions and 'to do' list in your head and getting on your meditation cushion or yoga mat, regardless of the chaos within or without, is a practice in iteself. This can be called your "sadhana" in Sanskrit, or spiritual practice. Once you take a few minutes to find a quiet space and place in your home (or at the office if able), you can then try some slow, deep breaths with the eyes closed to center yourself. Then perhaps move into a few gentle yoga postures and end with a few minutes of relaxation. It can be very simple (in a 5-10 minutes time frame) and help create a "firm foundation for restraining the mind flucutations" as Patanjali, a sage of yoga says when he desribes what yoga is. 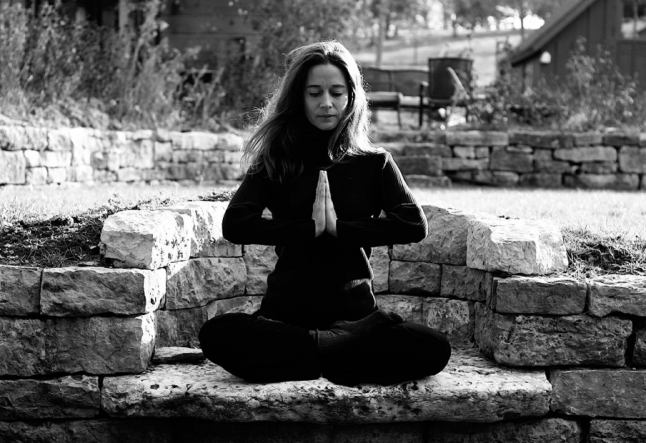 If you have a solid and consistant practice, whether your moods are happy, sad, or neutral and whether life on the outside feels good or not so good, the yoga practice or 'sadhana' creates a steady and consistant place you can turn to, that is always there, when you need to find peace, inner strength, inspiration, creativity, relaxation, balance or anything else you are needing. Life is not always easy, but yoga can help us on explore and enjoy the journey. Suggested book : SunLight Chair Yoga: Yoga for Everyone!